Forests and the soils that serve as their foundation cover almost a third of the world’s land area. Soils influenced by forest cover have different properties than soils cultivated for agricultural use. Ecology and Management of Forest Soils provides a clear and comprehensive overview of the composition, structure, processes, and management of the largest terrestrial ecosystem. From composition and biogeochemistry to dynamics and management, this essential text enables readers to understand the vital components of sustainable, long-term forest soil fertility. The interaction of trees, animals, microbes, and vegetation alter the biology and chemistry of forest soils—these dynamics are also subject to human management, requiring conservationists to be conversant in the philosophy and methods of soil science. Now in its fifth edition, this classic text includes new coverage of uptake of organic nitrogen in forests, 15N retention studies, the effects of N additions on C accumulation, evidence-based examples of the dynamics of soils, and more. Extensive updates and revisions to topics such as spatial implications of megafires, long‐term organic matter accumulation, soil characterization, and molecular soil measurement techniques reflect contemporary research and practices in the field. 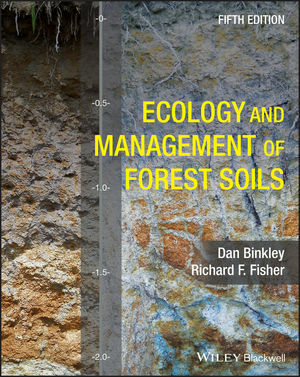 Ecology and Management of Forest Soils offers students in areas of soil science and forestry, natural resource and environmental management, ecology, agronomy, and conservation an invaluable overview of the field, while providing forestry professionals an efficient and current work of reference. Dan Binkley is Adjunct Professor in the School of Forestry, Northern Arizona University. The late Richard F. Fisher's career included professorships at the University of Florida and Texas A&M University. He made many lasting contributions to the field of forest soils, of which this book is just one.